The South West Expo took place on the 5th July 2018, at the Steam Museum in Swindon and brought together all the most recognised and innovative companies operating in the South West of England. As one of the Expo’s most regular and popular exhibitors, the Army Parachute Association attended there this year in order to showcase their services. Based at the Netheravon Airfield, the not-for-profit association provides parachute training for both members of the public and retired military members. If you’re over the age of 16 and are seeking a once in a lifetime experience, skydiving could be just the thing for you. With their expert training, APA is dedicated to promoting skydiving and sports for military personnel, whether active or retired, and for all members of the public. 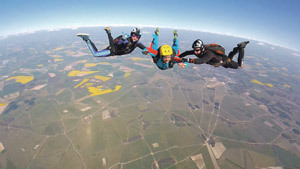 Learn to skydive for the fun of it, for the sporting health benefits, for charity or even for your own special occasion! At their showcase at the South West Expo, APA held video demonstrations, brochures on all their activities and availabilities and much more. If you would like to get in contact with the Army Parachute Association then be sure to get in contact using the number below or alternatively, please feel free to check out the website where you can find more information. This entry was posted in Industrial Solutions and tagged Army, Parachuting, Training. Bookmark the permalink.